An authoritative remote sensing study of Mangroves in Belize (4.53MB PDF) has published its results. The authors have provided a report and data online. One of the things I like in the report is the unvarnished assessment of previous work and the plain description of the pros, cons and choices made when conducting this remote sensing study, e.g. in terms of choice of imagery and techniques. It provides a realistic account of doing such work and this, in addition to the scientific results and data, make this a highly-recommended read for students, professionals and decision-makers in the Region. Further details below. Thanks E. Cherrington. The Water Center for the Humid Tropics of Latin America and the Caribbean (CATHALAC), recently completed a World Wildlife Fund (WWF)-financed study of the mangrove ecosystems which are a crucial part of the Belize Barrier Reef Complex – the world’s second largest coral reef system – and part of the broader Mesoamerican Reef Ecoregion. The study, “Identification of Threatened and Resilient Mangroves in the Belize Barrier Reef System,” found that Belize’s national mangrove cover had remained at 3.4% over the 30-year period from 1980-2010, even as mangrove cover declined from 76,250 to 74,684 hectares during that period. The assessment made use of the Regional Visualization & Monitoring System (SERVIR, see www.servir.net), which is jointly implemented in Mesoamerica and the Dominican Republic by CATHALAC, the U.S. Agency for International Development (USAID), NASA, and other partners. Belize’s mangroves have been protected since 1989 under the country’s Forests Act, which requires legal permission for altering areas with mangroves. The clearing of some 1,566 hectares of mangrove from 1980-2010 translated to an average loss of 53.6 hectares per year, or an annual rate of loss of 0.07%. Based on a previously determined baseline, it was also estimated that as of early 2010, Belize’s mangroves covered 96.7% of their original domain. An analysis of the ‘hotspots’ of clearing showed that almost 90% of all mangrove clearings occurred in four zones near major coastal settlements: Belize City, the Placencia peninsula, San Pedro Town, and Dangriga. Destruction of mangroves – largely for the development of urban- and tourism-related infrastructure – was also found to have caused the fragmentation of 2.1% of the country’s mangrove ecosystems. While the assessment examined all of Belize’s mangroves – i.e. not just the ones which interface with the coral reefs and seagrass which are also a part of the barrier reef complex – it was found that over 90% of mangroves lost over the 30-year period possessed connectivity with coral and seagrass. Those types of mangroves were also estimated to contribute US $3-4 million per year to Belize’s fisheries sector alone and a total of US $174-249 million per year to the national economy, according to a 2009 World Resources Institute assessment. Belize’s low rate of mangrove clearing nevertheless stands in stark contrast to recently published estimates of global mangrove destruction. The 2010 World Mangrove Atlas, for instance, indicates that a fifth of the world’s mangrove ecosystems have been destroyed since 1980. The findings of a recently released USAID-supported study of deforestation in Belize, implemented by CATHALAC and NASA in collaboration with Belize’s Ministry of Natural Resources and the Environment, also contrasts with the WWF-funded mangrove study. Over the last 30 years, Belize’s annual rate of mangrove clearing was merely one-ninth of the country’s annual deforestation rate of 0.6%. Belize’s only previous effort at specifically mapping the country’s mangroves is a national map of mangroves’ cover in 1990. The present effort thus provides decision-makers with a current panorama of the situation of the country’s mangroves. 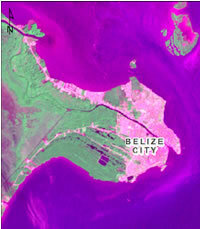 In terms of follow-up, while it is anticipated that the study’s results are highly accurate due to the image processing approach used, in the next few months WWF and its local partners will conduct intensive field verification activities as well as with comparisons to aerial photography that has recently been taken of Belize’s entire coastline. They will also undertake biological surveys to assess both ecosystem health of and the biodiversity within Belize’s mangroves.